The M22 Series panel mount signaling alarms are made of heavy-duty industrial, UV stabilized polycarbonate and are intended for indoor or outdoor use. They are UL Type 4/4X/13 and IP65 approved for harsh environments and are watertight. The M22-30K models are specifically designed for the food industries and have fully enclosed housings to prevent contaminates from accumulating. The M22 series alarm sounders are equipped with a plug-in three point finger-safe terminal block for ease of wiring and configuring the tone type. All M22 models can be configured for either continuous or pulsing tones. The M22-65G models can also be wired for a wobble tone (alternating frequency). 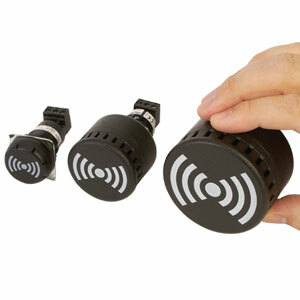 Users may also adjust the intensity of the sound levels on the 45 and 65 mm (1.8 and 2.6") alarm models. View Specs above for additional information. 30 mm (1.18 inch) signaling alarm, 65 to 70 dBa, 12 to 24 Vac/dc. 30 mm (1.18 inch) signaling alarm, 65 to 70 dBa, 120 Vac/dc. 30 mm (1.18 inch) signaling alarm, 65 to 70 dBa, 240 Vac/dc. 30 mm (1.18 inch) signaling alarm, 80 to 85 dBa, 12 to 24 Vac/dc. 30 mm (1.18 inch) signaling alarm, 80 to 85 dBa, 120 Vac/dc. 30 mm (1.18 inch) signaling alarm, 80 to 85 dBa, 240 Vac/dc. 45 mm (1.77 inch) signaling alarm, 85 to 100 dBa, 12 to 24 Vac/dc. 45 mm (1.77 inch) signaling alarm, 85 to 100 dBa, 120 Vac/dc. 45 mm (1.77 inch) signaling alarm, 85 to 100 dBa, 240 Vac/dc. 65 mm (2.6 inch) signaling alarm, 85 to 105 dBa, 20 to 24 Vac/dc. 65 mm (2.6 inch) signaling alarm, 85 to 105 dBa, 120 Vac/dc. 65 mm (2.6 inch) signaling alarm, 85 to 105 dBa, 240 Vac/dc.